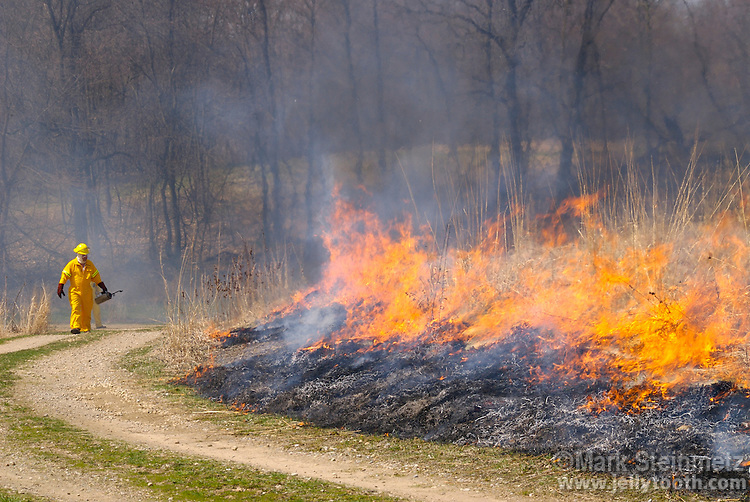 A controlled or prescribed prairie burn in a restored tallgrass prairie in Central Ohio. Used as a management technique, controlled burns mimic natural fire processes, which allow prairies to thrive by inhibiting many invasive annual weeds, stopping growth of invading tree and shrub species, returning critical nutrients to the soil, and stimulating germination by allowing the sun to warm the soil. Such burns are usually performed in the early spring before most prairie perennial forbs and grasses green up, utilizing accumulated dead vegetation as fuel. Prairie fires can move as fast as 600 feet per minute and burn as hot as 700 degrees Fahrenheit, or 340 degrees Celsius. The native tallgrass prairie ecosystem has been mostly lost to use of land for agriculture in the United States, with less than 5% of native prairie surviving. Ohio is the on the far eastern edge of its range.